Arrive in Bali Airport. On arrival, meet and transfer to your hotel for overnight stay. At 19.00 enjoy your Romantic Candle Light Dinner. Leave from hotel in the afternoon and then drive to Padang – Padang Beachor Eat, Pray & Love Beach is a famous surf point in Bali with the great waves and white sandy stretch 100 meters from the north to the south. 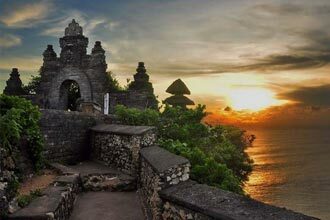 This surf point is situated the white stone hill with nature scenery to the Indian Ocean and spectacular sunset at late afternoon that creates the romantic nuance and thendrive to Uluwatu to enjoy sunset of Bali from our holy Uluwatu temple located in southern part of Bali and last Jimbaran barbeque seafood dinner before check in to your hotel in Tuban. Breakfast and then enjoy your time in the resort. In the afternoon go to the beach or just walking in Tubanmain street Day 05: Tuban – Ngurah Rai Airport – Flight Home(B) Transfer to Ngurah Rai International Airport for your flight home or next destination.